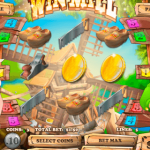 Win Mill is a 3 reel / 5 payline slot game released in 2012 by Rival. The theme here is a dutch windmill and the whole background looks like it was taken from a small village in the Netherlands. This of course include the symbols like the tulip, dutch cheese and wood shoes are all famous dutch symbols. The scatter in this game is the Gold Coin symbol and landing 3 on an active payline will get you to the Bonus Game. 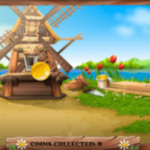 Here you will be asked to catch coins flying out of a windmill. The more coins you catch the bigger your prize will be. Another feature is “Guess the coin” type of game. The dutch girl will hold a gold coin in one of her closed hands and you’ll have to guess in which. However, this feature is randomly triggered so just keep spinning till you get it. 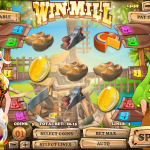 Win Mill is a great 3 reels slot game. We think that it is much more interesting and engaging than the classic 3 reels slots and the bonus features are also fun. If we have to mention a negative it would be that the bonus features are a bit hard to come by. Other than that we really like it! If you like innovative classic slots then you should consider playing Tahiti Time a 3 reel slot by Rival.